Today we released the M3 Milestone build of Hudson 3.0 at Eclipse. M3 is a biggy as we’ve finally managed to unravel most of the IP spaghetti surrounding the original Hudson code base and come up with something that an organization can be confident in using with the knowledge that we know where every bit of code came from and under what terms it was contributed. This may seem boring and legal but the truth is that you can’t just trust the licence on the box front so to speak, libraries depend on libraries which depend on libraries. The original Hudson code base was such a melange of licenses including LGPL, Apache, specialist, none at all… (the list goes on). Now we’re down to a list of somewhat over 70 libraries used by core, all of which have been approved, or are in the process of approval, via the detailed Eclipse IP processes. Great, so what does that mean? Well one of the consequences of the “Great IP Cleanup”, as we’re calling it, is that we’ve had to pull certain bits of functionality from Hudson Core, you may have already noticed that in some cases we’ve be able to replace functionality (e.g. replacing the LGPL JFreeCharts with Eclipses own BIRT charting engine) In other cases we’ve had to move the code out of the Eclipse code base into a “required” plugin which remains in the Hudson-plugins code base. Examples of these include features such as Groovy Support (uncertain provenance for the Groovy code base) and SVN Support (The SVNKit license is incompatible with Eclipse). So what to do? Well fire up an M3 build and you’ll find out! This screen provides a simple way to ensure that the Hudson instance can get access to all of the required-but-non-Eclipse plugins that it needs (plus some of your favorites besides) in order to be fully functional. If you scroll to the bottom of the page you’ll see there is also a section to configure your proxy if you’re behind one – make sure you fill this in (and use the Test button to check you have the details right!) if you need to. You can download the M3 WAR file from the Eclipse download page here. Thanks for cleaning up this mess, it’s much appreciated! Do you have a release date for 3.0.0 already? Or will there be more milestone releases, and if yes, what are they about? The current plan is for an M4 release in three weeks time or so with the final production release candidate at around 27th July. 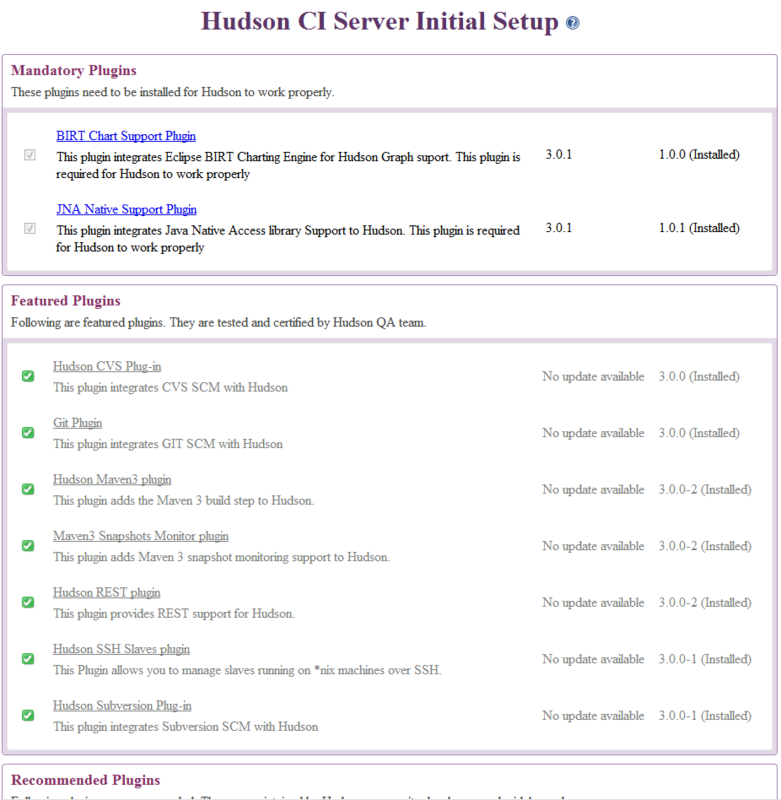 there was recommendation to use Hudson as a service for 2.x version. I don’t see it in the roadmap. What is the status for it? i’m stuck on install of mandatory plugins. First, proxy config popped up, and i resolved that. Then the plugins try to load, and all come back with the red fail circle. Is there a way to see the cause of failure? You may want to try cleaning up your ~/.hudson directory – you may have some of the plug-ins partially downloaded or stuck with -temp versions. We know of an existing problem with installing on Windows as well – you may have to have several attempts on that platform – we’re working on it. is there a way to skip past the initial config page? Because I was having proxy setup issues, I downloaded the required hpi files and manually placed them in the plugins dir. 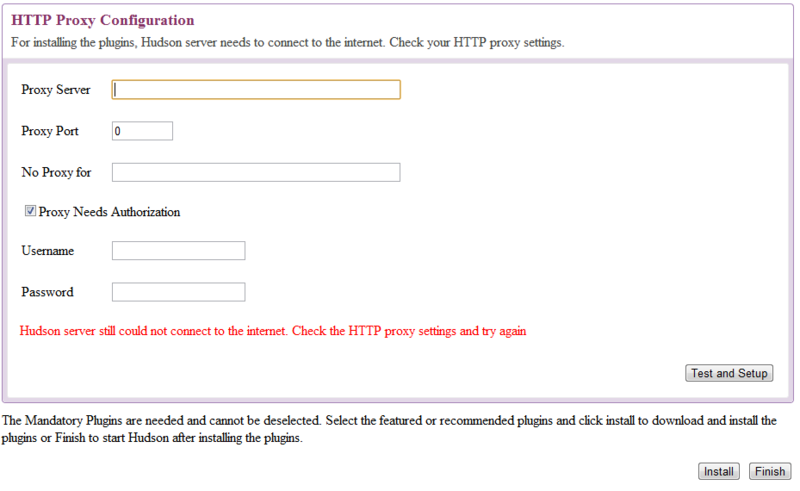 The initial setup page shows the required plugins as properly installed – green checkmarks. But still I can’t get past the proxy page. It is complaining about not being able to connect to the internet. As it no longer matters, I would just like to skip past this for now. Is there some kind of file flag I can place or something? Mike, if all the mandatory plugins are installed, simply clicking Finish should take you to Hudson. Is that not happening? Hey, thanks for the post. This is helpful. I am trying to upgrade from 2.2.1 to 3.0.0 and have run into an authentication problem. Hoping you can help. I get the “Initial Setup Required…” notification. When I start up the Dashboard to install the plugins, I get an authentication prompt saying that the user is required to be admin to proceed. Well, none of the logins appear to work (root, hudson user, etc.). What “admin” user is Hudson asking for? Admin to the system, or Hudson admin, or someone else? Thanks.